This is a teaser from Maggie Stiefvater's BALLAD, a novel involving homicidal faeries and kissing that's coming out October 1st. He turned towards me. For a long moment, he stood facing me. I was held, anchored to the ground – not by his music, which still called and pushed against the music already in my head and said grow rise follow – but by his strangeness. By his fingers, spread over the ground, holding something into the earth, by his shoulders, squared in a way that spoke of strength and unknowability, and most of all, by the great, thorny antlers that grew from his head, spanning the sky like branches. Then he was gone, and I missed his going in the instant that the sun fell off the edge of the hill, abandoning the world to twilight. Buy it here. Enter the contest at Maggie's blog here. OMG this looks so good how have I never seen it before? Oh well thanks to your review I ordered it today so I am excited!!! 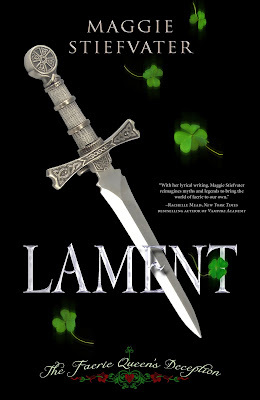 I read Lament and it is really good. I love Luke! 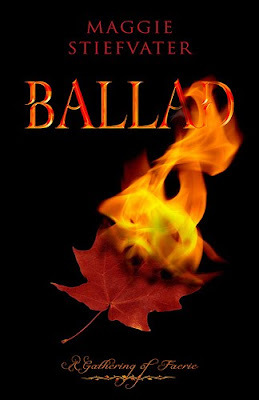 I haven't read Ballad yet, but it looks pretty good too.